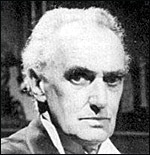 A hugely prolific Scots character player, John Laurie was Central School-trained, on stage from 1921 after World War I service and in films since Juno and the Paycock (d. Alfred Hitchcock, 1930). Gaunt-faced and intense, he came to attention in his third film, Hitchcock 's The 39 Steps (1935), as the jealous crofter, and was memorable again and again, in three 1944 films: The Way Ahead (d. Carol Reed), as the farmer recruit; Fanny By Gaslight (d. Anthony Asquith), as the proprietor of 'The Shades' brothel; and as Captain Jamie in Henry V (d. Laurence Olivier). He was in all three of Olivier 's Shakespeare films, not surprising for someone who spent so much time playing the Bard at Stratford, the Old Vic and the Open Air, Regent's Park. There was also a great deal of TV, most popularly as Frazer in Dad's Army (BBC, 1968-77, also in the 1971 film version, d. Norman Cohen), and he finally appeared looking sprightly but (as you might after such a career) frail in Return to the Edge of the World (d. Michael Powell, 1978) as one of the surviving participants of Powell's 1937 romantic melodrama, The Edge of the World . Did such actors ever have a holiday?